We tend to think of insects as invasive wildlife. We consider them health hazards, destructive pests, and nasty little critters that breed and do their private business in and on our food. Grub might mean food, but bug is a synonym for germs and synonymous with irritating behaviour or computer glitches. We spray, swat, and stomp on them. Many insects think we’re something to eat. We seldom bite back. That may change. Actually we all eat insects without any harmful side effects; roughly 500g of creepy-crawly per annum. Unless you’re on Fear Factor or a similarly distasteful reality television show, if you live in the West you partake of bug unknowingly. Apart from the urban myth that we eat spiders in our sleep, scrunched up beasties find their way into processed foods such as tomato sauce, peanut butter and chocolates. There are regulatory tables limiting how much and what kind of arthropod is allowed in your food. 20 maggots per 100g of canned mushrooms is acceptable. When new US food labelling rules come into force in January, we may all be surprised by how many of the beverages and foods we consume contain the red dye from ground-up cochineal scale insects. Most of humanity however eats insects as a matter of course. I first found this out backpacking through South-East Asia. In markets there, baskets overflowed with fried cricket, locust and even praying mantis. Termite flour is common in Nigeria, as are termite stock cubes; in Uganda, termites are lured to the pot by special drumming techniques, and palm grubs are sautéed in their own oil; there are sago grub festivals in New Guinea and Nigeria; in Algeria, locusts are cooked in salt water and dried. The variety is great, with flavours from peppery and nutty to salty and buttery, from charcoal roasted dragonfly in Bali to huhu beetle grubs in New Zealand. And why not? We’ve watched David Attenborough eat live honeypot ants on camera. Heston Blumenthal, the celebrity television chef, sampled mealworms and canned silkworm pupae, before serving his A-list guests deep-fried crickets and tomato-filled grubs. Some researchers estimate insects destroy 25% of world food production. As global population burgeons exponentially, the tables will have to be turned. In a paper delivered at the Royal Entomology Society conference at Swansea University earlier this year, Professor Arnold van Huis of Wageningen University in Belgium (no reflection on his national cuisine) proposed insect protein as the most realistic solution to world nutrition. The argument for entomophagy is compelling; rationally, there is no reason not to. We have run out of cultivatable land. To produce a kilogram of cricket meat requires less than 15% of the input needed to produce the equivalent amount of beef, a fraction of the cost and far less carbon emissions. Insect farming, even on a large scale, carries fewer health risks than conventional industrial agriculture. You’re not going to get mad beetle disease any time soon. Insect meat is high in protein, low in fat, and rich in B vitamins, iron and calcium. There are almost 1500 species of edible insect. To boot, they’re kosher. Leviticus 11:21-22: “you may eat those that have jointed legs for hopping on the ground. Of these you may eat any kind of locust, katydid, cricket or grasshopper”. The Pentateuch however forbids eating sea goggas: “Anything living in the water that does not have fins and scales is to be detestable to you.” Were prawns land-based creatures (as some believe they are in Parktown), there’d be a lot of jumping on chairs and screaming. Vincent Holt in a rather delicious little tract, Why Not Eat Insects? (1885), hoped he’d found the solution to malnutrition amongst the working classes. His menus read like a Monty Python sketch: slug soup, stag beetle larvae on toast, new carrots with wireworm sauce, caterpillar garnish, and curried cockchafers (no kidding). In the downstairs food hall of Fortnum and Masons, London, I found translucent amber toffee containing a real edible scorpion, giant Japanese hornet in a bottle of clear honey, oven-baked whole Cambodian tarantula, and vacuum- packed, salted Mopani worms. Like many Westerners, I’m irrational when it comes to eating grubs. The only caterpillar I’d ever chomped was in Mexico; the maguey worm at the bottom of a bottle of mescal, and only after I’d finished the mescal. In South Africa, the vivid-coloured larvae of the Emperor Moth feed on Limpopo’s attractive Mopani trees, hence their common name. Mopani is now a multi-million rand industry. Harvesters extrude the green guts from a worm (Imbrassia belina, known as Masonja in North Sotho) as if milking a teat. The bigger the caterpillar, the better; young worms have less taste. The Mopani worms are boiled in salted water for 30 minutes, before they are dried in the sun by turning them every hour or so. This can take all day. 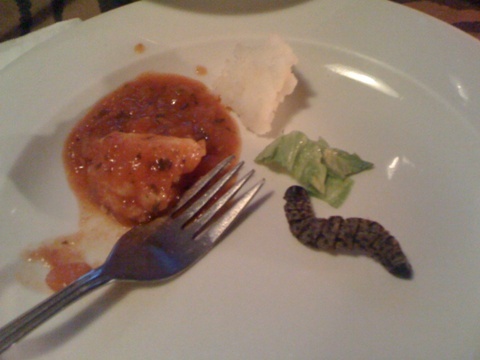 Not uncommon in Johannesburg, Mopani worms seem to have disappeared from the menus of most of Cape Town’s African restaurants such as the Africa Cafe and Mama Africa. One of the few places serving them is Marco’s African Place. Mopani worms (R85) on a bed of salad take about 25 minutes to prepare. They are salty and chewy, and they are quite heavy on the stomach; the word ‘delicacy’ didn’t spring to mind. Thongolifha, an edible stink-bug (Encosternum delegorguei), considered a pest by some farmers, is a delicacy among the Venda, and in parts of Zimbabwe. The live bugs have to be provoked with hot water and repeatedly rinsed until they are void of their extremely pungent defensive pheromones. Protein-rich thongolifha are boiled live and dried. The past decade has produced numerous insect cookbooks. If you’re bitten by this bug, you might put away the Doom and reach for the Spray and Cook. Marco’s African Place, 15 Rose Lane, Cape Town. Tel: 021 423 5412. I I am hardly out of the car, and Guiseppe is there to welcome me with an all encompassing bear hug. We haven’t seen each other for seven years. He’s an unusual character; not exactly eccentric, certainly unconventional, always big-hearted. Guiseppe Massolini was born in Dar es Salaam. His step-great grandfather (who passed away in 1976) was originally a Sikh. He cut off his kesh and turned Catholic, to marry and take care of the Italian widow he had fallen in love with and her 11 kids. Something about the romance of that act still informs Massolini’s life. I met chef Guiseppe (he doesn’t care for being called Mr Massolini) in the 1990s, when he ran a very popular supper club in an old house on Buitenkant Street. I know many Capetonians who still pine for those celebrated evenings. The place was crammed with Art Deco furniture and light fittings. Three nights a week, he would have two tables with around 30 guests. It was fully booked for six months in advance. I’d stand in the kitchen (where he taught me to make potato gnocchi), paging hopefully through the reservation book, looking for an open seat. Sometimes, I’d simply end up in the scullery. One day, I discovered Guiseppe had sprouted a large tattoo. Shortly afterwards, he sold up Buitenkant Street and moved to Barrydale – gateway to the alternative Karoo. We lost touch. It is exhilarating to report that he is now back on the gastronomic circuit with a “supper club” that serves lunch. These lunches frequently end with a tarot card reading. As long as I’ve known him, Guiseppe is teetotal, but that doesn’t stop the Paarl locals from affectionately calling him ‘Gesuipie’. Guiseppe’s home is off the R101 on the Belair farm, which has a luxury guesthouse complete with Lombardy poplars and a full-size Chartres labyrinth of yellow gazanias. The farm was once a racehorse stud and home to multiple winner, Occult, the only South African-bred horse to win the coveted treble: Republic Day, Durban July and Gold Cup. You’ll find Guiseppe in the converted stables. The driveway is bordered by lemon trees – the sweetish, wrinkly-skinned Cape lemons that turn orange, and the smooth Eureka strain. Guiseppe leads me in through the back. The entrance has a peach pip floor. “You should take off your shoes, it gives a wonderful foot massage,” he says. The grounds are populated by angels, Buddhas and garden gnomes. Guiseppe makes his own Madonnas and sculptures out of cement. To the rear is the folly, a mock classical Greek ruin with pillars. Granadilla vines shade an outside table. Hadedas and sacred ibis fly overhead. “Nature is my divinity,” he says. In his permaculture garden, Guiseppe grows some of his vegetables, including tomatoes, bell peppers and a variety of bitter, reddish lettuce. He tries to source all his produce from within a 10km radius in the slow food way, though in Italy this is far easier to do. His cheeses come from Zandam, among the first local producers to make mozzarella, ricotta and provolone in South Africa. The kitchen is a long, narrow galley. My eye falls on a photo of Guiseppe in uniform during his army year in Italy; he is putting on a brave face. Together with 27 dolls of witches, his granny’s gorgeous, Art Deco, pink seashell light from Dar es Salaam, hangs from the ceiling in the informal dining room. The bric-a brac furnishings include Art Deco cabinets and chairs, and a 1960s Formica table graced with a vase of tall arum lilies. In winter, the fireplace is lit; in summer, it is possible to dine outside on hot days. What little space is left, I must now dedicate to his glorious food. The antipasto is grilled crostini “alla moda” topped with pimento olives and tomato paste. For his home-baked ciabattas, Guiseppe is particular about using Eureka Mills’ slow, stone-ground flours from wheat grown by crop-rotation and good-tillage practices. His much-admired mains are: a “big fat” green risotto, with broccoli, spinach, zucchini and gorgonzola; homemade potato gnocchi with pancetta, chilli and tomato; osso buco alla gremolata; slow-roasted loin of pork cooked in sweet wine with caramelized Golden Delicious apples. A typical set menu includes two salads. We had fresh lettuce with fennel bulb and an outsized green salad with balls of boccini cheese. You need to pace yourself, as desserts are a strong point. There is double-chocolate tart, a sort of death alla Venezia; almond and butter tartlets; the type of strudel with which Marie Antoinette bankrupted the monarchy – pears, pink apples, cinnamon cloves in a pastry, with custard and gooseberries, blueberries and strawberries, with swamp mint and satsuma (a kind of naartjie), and garnished with lavender. To wend one on one’s way, Guiseppe pours bottomless rounds of espresso, and offers plates of almond, apricot, and cherry biscotti. Guiseppe’s Italian catering. Book three weeks in advance. R200 per person. A minimum of eight, a maximum of twelve guests. Arrive at noon, eat from 1pm “until whenever”. BYOB (bring your own bottle) basis. A donation for tree planting is always welcome. Over a hundred trees have been planted through this effort already. Tel: 021-863 1187. This article appeared in the Mail & Guardian September 17, 2010.